Like walking through a winter forest, this gorgeous holiday gift delights the senses with bright Christmas blooms, fresh winter greens and a beautifully detailed glass cube. 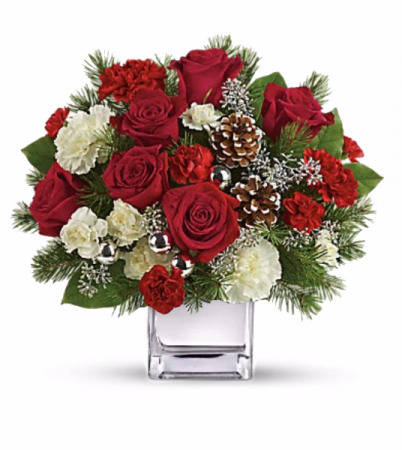 Add some romance to the holiday season with this rich arrangement of luxurious flowers in classic winter colors. 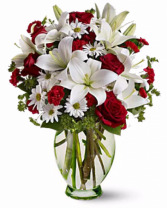 Red roses, snow white lilies and playful daisies are gathered in a ruby red vase she'll use well beyond Christmas! 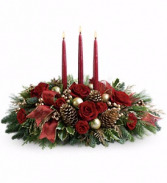 For an elegant wedding/christmas centerpiece that is equal parts romance and resplendence, this is a wonderful arrangement for your reception. 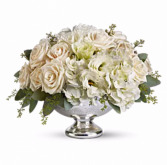 With White Velvet appeal and excitement, a brilliant Silver Bowl full of dazzling roses, hydrangea and more is sure to be the toast of the town.